The South Australian Pattern Championships, November 1 and 2, 2008. The South Australian Pattern Championships were held at the Constellation field on November 1 and 2, 2008. 18 Pilots from South Australia and Victoria originally entered this event, with only two late scratchings reducing the final numbers to 16. Sunday's weather forecast was not looking favourable, so all pilots flew four rounds on Saturday in case the weather caused a premature end to the contest. Strong winds Saturday blew from the north east, however most pilot still managed to put together some nice flights. SA's John Tonks returned to F3A after quite a number of years out, his experience and skill certainly showed in the conditions performing some tidy flights for impressive scores with his electric powered Sebart Angel (boy, those Angels are an impressive plane). Rob Clarke flew his impressive electric powered Wolfgang Matt designed Oxai "Amethyst" Biplane . . Very nice looking plane with a most amazing build quality. Sunday, after early morning rain, the wind direction shifted to the west and the rain cleared, so the remaining flights were competed and the event concluded at around 2.00pm. In the end, Glenn Orchard from Mildura won F3A pushed all the way by SA's John Tonks. Expert saw Melbourne's Ron Schultz pilot his Extreme Composite Proline to victory ahead of young James Nugent from Mildura (who borrowed a plane on the Saturday). Advanced had Mildura's Jason Sparks taking the event, and Sportsman saw Mildura's Dave Nugent win from SA's Jeremy Reynolds (with another of those great Sebart Angel's). The SAPA Perpetual Cup sponsored by Bolly Products was won back this year by Neil Martin. It was a close local contest with the margin over the year being around 20 points or so over Jeff Boyd. Thanks again to the Constellation Club for allowing us to hold the Championship at their magnificent field, and provide us with a great BBQ. Thanks also to Jeremy Angel for another well run competition aided by Verna Martin and Bev and Henry Hutchinson. As viewed from Down Under! G’day, a few weeks ago I was asked to write an article about the Combined Asian Oceanic Continental Championships (CAOCC) for the K-Factor magazine in the USA. Given most of you wouldn’t know anything about me and not much more about precision aerobatics in Australia I thought I’d start with a short intro. 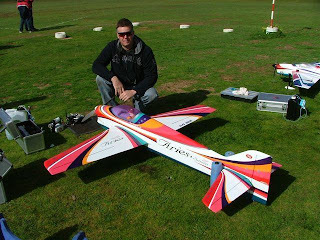 My name is Bill Bloodworth, I’m 30 years of age and I’ve been flying RC and aerobatics since I was 14. I have competed at 3 World Championships and 4 CAOCC’s. Like many modellers my age I was introduced, trained, financed and supported through the sport by my father who continues to compete in F3A here in Australia. Precision Aerobatics in Australia is quite a small community spread across great distances. I’m located in Melbourne which is in the south east corner of Australia. There are approximately 250 active pilots and about 30 of those fly the international F3A Class. The Combined Asian Oceanic Continental Championships is a relatively young competition with the recent event in Taiwan being just the 7th Championship. The first event was held in Australia in 1996 and since then the number of participants, competition standard and the status of the event have grown significantly. I was lucky enough to travel to Taiwan with a good friend and first time international competitor Glenn Orchard (aka GlennO). GlennO has been flying F3A for about 5 years and over the past 2 years has been knocking on the door of Australian team selection. Given this was the first time GlennO had placed his “pride and joy” in a tin can and entrusted it to the baggage workers of the world he was very apprehensive about receiving a box of balsa at the other end rather than an F3A model… Of course I hadn’t helped to ease GlennO’s mind recalling all the horror stories I could think of on the 15 hour trip. We arrived in Taipei a couple of days prior to official practice with an added bonus of 2 complete and undamaged models. The next challenge was to organise all the basic requirements (van, fuel, directions, WATER) so we can get some much needed practice in the local conditions. One of the issues for us F3A pilots from Australia is that every time we go to an international event it’s in our off season. Glenn and I had been practicing 2 days prior to leaving in high winds 25+mph and temperatures of 16-19C (don’t know what that translates to in F). So when we arrived in Taiwan we were very pleased to hear that the long range weather forecast was for light winds and warm temperatures 30-35C. After fluffing around organising all our basic requirements it was time to make the leap of faith you all take for granted and drive on the WRONG side of the road….. To clarify, Wrong = the Right hand side. Glenn and I had been arguing about who would brave the driving in Taiwan with 11 million scooters and a similar number of vehicles all darting around like combat models. Luckily for us our third and most experienced team member Steve Coram (from the wrong side of Australia = Perth Western WA) arrived. Given Steve was last to arrive and the most experienced (Australian F3A team member on 25+ occasions) was quickly out voted 2 to 1 and became our team driver. After a Twenty minute journey though the centre of Tai Chung City the GPS unit told us we had arrived at the practice field. The only problem was we were still in the city and parked on the edge of a levy bank that looked like the water had only just subsided in the past week. As Steve and I started looking for possible flying sites near by on the GPS, we were rudely interrupted by the thud of GlennO’s jaw hitting the floor followed by the muttered words “I’m not flying there”. On closer inspection, a small concrete strip set inside the levy bank could be seen and here was the Hong Kong, Taiwan and Thailand F3A teams preparing for a day of practice. After the normal greetings and catch up, we assembled our models, convinced Glenn the site was fine and joined the end of the practice list. An hour later it was my turn to kick things off for the Aussie team. I clipped the glow driver up hit it with the starter and the O.S. (OS 200 FI) fired first shot. After a short take off, I commenced a procedure turn past the apartment blocks, straightened up along the sports stadium and established a good line right over the town hall. After what I thought was a solid flight Steve wanders over and asks why I was laying every vertical 5 degrees off to the right when there is absolutely no wind. I had no good answer other than I haven’t flown in the calm for so long I forgot what vertical actually looked like. After some minor adjustments using Steve’s keen eye we managed to get a little closer maybe 4.5 degrees. Time to land, so I descended down past another apartment block over the water in the levy bank, a quick blip of throttle to clear the cars parked at the end of the strip and down onto the runway. Flight one down….just another flight at an everyday local club field. After 2 days of practice in the levy bank the Australian team was starting to acclimatise to the warm and calm local conditions, the added bonus was getting comfortable flying past buildings on the baseline. The competition site was fantastic, a decommissioned military base only 15 minutes drive from the hotel. There were large marques set up with each nation allocated enough space for their models and two work benches for any last minute adjustments or repairs. Official practice was the first opportunity to assess all the competition and see who was flying what and more importantly get a close up look at what the Japanese team were using. To the best of my knowledge there were no major issues with model processing which was no surprise given the number of Oxai, Extreme composite and other commercially available aircraft. The plane of choice at this CAOCC appeared to be the Altair 200 from Extreme Composites very closely followed by the Oxai Aries. However the plane that stimulated the most interest was Michael Rammels Oxalys with counter rotating propellers. Michael developed the gearbox and other technical bits for this power plant and it is the same system Silvestri used at the European Champs with great success. Another neat bit of engineering on Michael’s plane was his retractactable undercarriage. For those who haven’t seen the counter rotating setup it is very impressive in the air with amazing constant speed and great downhill braking. As always the Japanese models were immaculately presented with Onda and Suzuki using the same aircraft they used at the World Championships in Argentina. Onda flew the Aries in the preliminaries and the Narlar Bipe in the finals and Unknown schedules. Both Onda’s aircraft were powered by the YS170DZ (not CDI). Suzuki’s Midrex was powered by the OS200FI and was clearly the quietest aircraft at the event. Masato the third Japanese team member was flying his own designed Voyage, powered by a Hacker, again the plane was flawlessly presented but had its own distinct style. For electric enthusiasts this design had the best battery and motor access I have ever seen. With official practice flights underway and the gallery making notes on the normal flight characteristics of how deep, how big, how slow, etc etc, it occurred to me that the competition had just begun! That said, when GlennO had some issues with his motor at official practice there were people coming from everywhere to offer assistance, spares and advice. In the end Glenn’s motor started for his practice flight but was not all that happy. Returning to our team garage we were approached by Onda and Naruke, they asked if they could have a look at the motor and offer some assistance. Obviously GlennO was very happy for them to tinker. After 15 minutes the Masters and Apprentice had the motor running perfectly and GlennO had learned something he would never have picked up back in Australia. This is what these competitions are about, learning, making new friends and seeing new places. The Japanese were the team to beat, Onda and Suzuki had a very close battle right through the semi finals. They appear to take this event seriously with all team members preparing 2 models for each flight leaving nothing to chance. Their team totalled 11 people with a number of supporters and helpers attending. The professionalism and the attention to detail leaves an impression and the flying from all 3 team members would have placed them in the top 10 at any world champs I have been to. From the other nations Alex Lau (Hong Kong) continues to improve and only missed the finals by 4 normalised points, Lin Tzu Chun from Taiwan was very impressive in the F schedules and Jun Kai Low from Singapore was also strong. After a hard fought battle 5 pilots progressed to the finals and the joy of flying Unknown schedules. Onda, Suzuki, Masato, Bloodworth, Coram. One of the more enjoyable parts of making a final at an F3A event is the Team Managers meeting where in turn each pilot selects a manoeuvre for the 2 unknown schedules. After finalising the flight order it was Mr Suzuki that selected the first manoeuvre and to give everyone a chance to settle in he selected a vertical humpty bump on centre. This selection set the tone for the first few manoeuvres, medium difficulty no brain benders!! Then we get to Onda’s last pick for the first rotation, a cheeky smile comes across his face, he laughs and selects a rolling something downwind etc etc, well I let out a bronx cheer and the room erupts into laughter….. Round two, 4 play nice, Onda lets rip again! This pattern continued with the bronx cheers right through the selection process. As we were leaving Onda came across tapped me on the shoulder and with a slight grin wished me luck……. In the end Onda had the last laugh with some very impressive unknown and F schedules. That said, Suzuki was very close and in my opinion appears to have closed the gap from the last world Championships. Masato was a clear third with some great flying but with a few more obvious errors and Steve and I flew well to stay in touch. Again the overall standard of pilots at this years contest has improved significantly with a number of new faces making the Semi Finals. There were 5 nations represented in the semi final group of 9 pilots. The closing banquet was held at the competition site compliments of Thunder Tiger with 500 guests in attendance. There was a range of entertainment including singing acts, belly dancers and 3D heli flying in the dark. It was a fitting end to an enjoyable event. On a different subject, with the recent crash of the Australian dollar versus the US dollar it’s a very cheap time for some of you guys to come and visit us here in Australia. 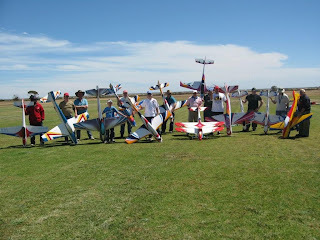 The Australian Masters (April 25 2009) is our biggest event and caters for all flying standards. There is a standing invitation for international guests, so if you’re interested, send me an email and I will point you in the right direction. Well we have been familiar with the grey skies, wind and rain in recent weeks, and Saturday dawned much the same . . no surprises there. That's how the day started, and basically remained all day, with periodic showers bidding a hasty retreat to shelter. We had a better roll-up to this comp than we have had all year, aided by the Mildura contingent who travelled to fly with us at this meeting. The group consisted of Glenn Orchard flying the F3A Class (Glenn is also a Australian Team member travelling to Taiwan in October competing in the COACC Asia Pacific event), Dave Nugent and his young son James (flying in Sportsman and Expert classes respectively) and Jason Sparks in Advanced (who is also a commercial pilot flying for Qantas). It is great that they travel to fly with us, as we really enjoy their company and have all become very good friends with them. Two day events are always popular with interstate pilots as the extra flying it makes it worth the trip. The competition day started with Jeff Boyd maidening his new Composite-ARF Integral (NOT what you are supposed to do with Pattern planes at competitions ;-). Unfortunately he had Pump problems so resorted to his trusty Impact for the first day of the competition. He was that happy with it's initial flight he vowed to forgo the social dinner on Saturday night and replace the pump ready for Sunday. The competition flights got underway, with some flying well and others showing a lack of 'stick time' due to recent weather conditions. Generally, the standard was pretty good. Young James (I think he is 10 now ! ! ) flew VERY well in the Expert class showing skill and precision beyond his years . . how good is James? Apparently he has been offered sponsorship from a very well known overseas Pattern Aircraft manufacturer. Stay tuned to the news on this kid, as from what we have seen, there is potentially BIG things coming for James internationally. The rain kept coming with some pilots landing under heavy rain, and only because the judges score sheets were so wet, the pens wouldn't write on them . .
On the Saturday we got to witness a couple of pilots in Harold and Andrew fly the new "club class" Sports Aerobatics. This is a new club based class that has a good spread of introductory style manoeuvres mainly for fun. They both flew really well for their first attempts, taking to it like "ducks to water" (almost literally :-). They both mentioned that they are keen to have another go. After the day was done, the Pattern crew met up at the Brahma Lodge Hotel for dinner, some ales and a tale or two as is customary with two day competitions, before retiring to refresh for another crack at it all on Sunday. GlennO showed why he is considered one of the TOP Pattern pilots in Australia with his demonstration of tremendous skill and precision consistent through all his rounds. Eventually a clear winner of the F3A class on the weekend. Neil Martin had minor engine issues to contend with but flew very well to finish in second. As promised, Jeff fitted a new pump to his Integral overnight, and after a little tuning, took off and flew the F3A schedule in practice without issue. He was very happy with the result, and although not finely trimmed for competition flying was more than happy to compete with it, finishing 3rd. Expert class had Matthew Cosier and James Nugent battling for the class win with James flying superbly edging out the spirited flying of Matt for the win. We have heard that Matt is taking delivery of a Oxai Pinnacle with YS160 power. It's an awesome combination, and in Matt's hands is sure to get some great results. In Advanced class there was Mildura's Jason Sparks flying against Graham Prestidge. The battle raged, and no-one was really sure who was doing better, however in the end Graham was the clear winner of this class. Sportsman saw Mildura's Dave Nugent flying against Jeremy Angel. Dave is flying better every time we see him, and Jeremy is improving all the time too, but Daves smoothness and consistency gave him the ascendancy in this class. At the end of the day, everybody was a winner, as these events are always great fun and the company of like minded individuals is always enjoyable. Special thanks to Greg Mildren for coming out to judge, Verna Martin for assisting with the score collating over the two days, and Jeremy Angel for his great organization. The next event is at the Strathalbyn club field on Sunday September the 14th. Any one who is interested in coming out to try "Sports Aerobatics" simply turn up some time during the day and we will fit you in for a fly and help in any way we can . . look forward to seeing you there.